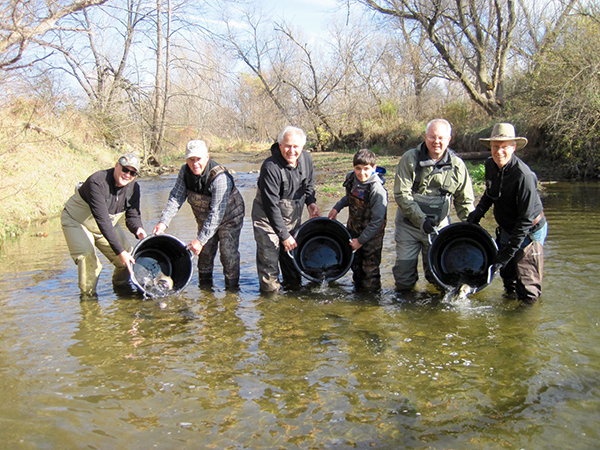 In the spring of 2005, The Clear Fork River Chapter of TU teamed with the City of Wooster to stock Apple Creek at Grosjean Park in Wooster with 500, 12-inch long rainbow trout. 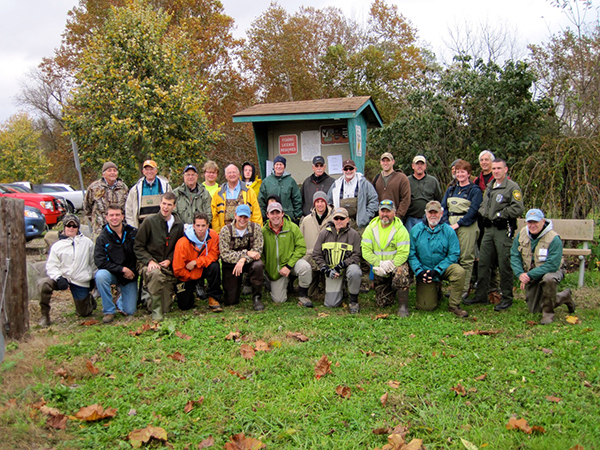 This was the start of an “experimental trout fishery” open to the public. Anglers were encouraged to fly fish and practice catch and release. The experiment was a success! 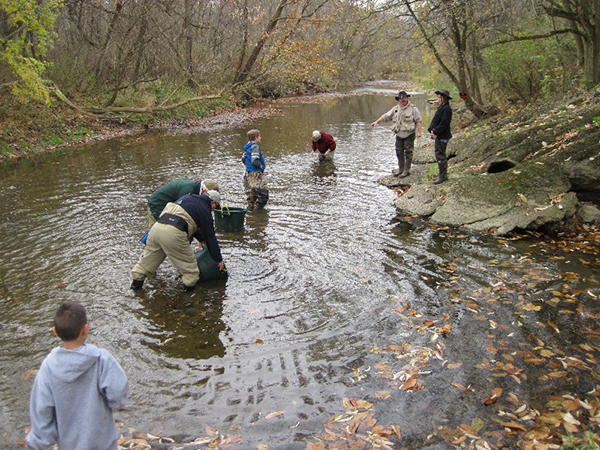 The stream was stocked again in the fall of 2005 and in the spring and fall of each year thereafter until 2011. 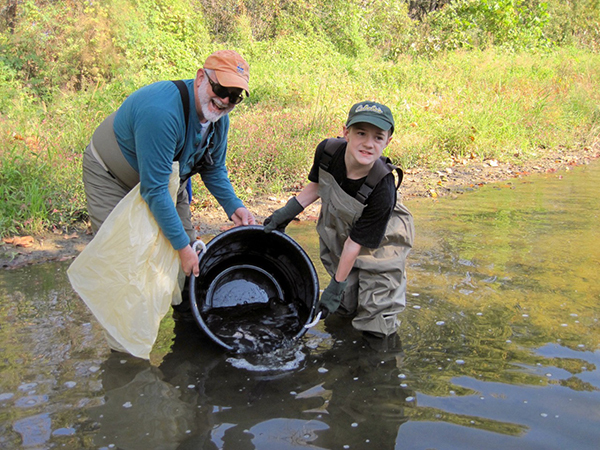 From 2012 to the present, the stream has been stocked in the fall only, once each in October and November. The fish overwinter successfully and provide excellent fishing all year, even in the stressful hot months of July and August. The stream is stocked with both rainbow trout and brown trout purchased from a private fish hatchery located in Castalia. The fish average 1.5 pounds each and 14-15 inches in length with some trout weighing in at 3 pounds and 20 inches. 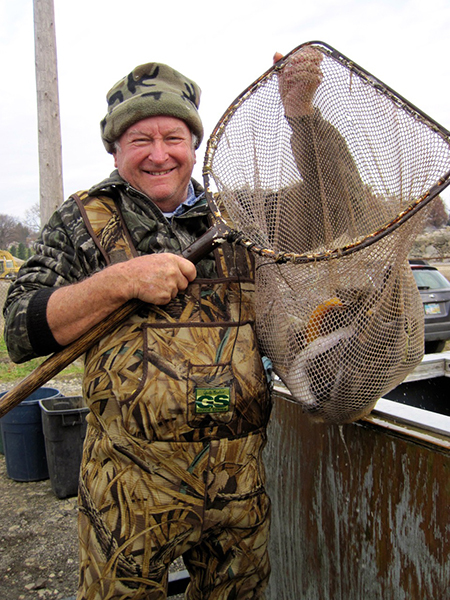 The cost of purchasing the trout is borne by grants from the Ohio Division of Wildlife, the City of Wooster and the CFRTU chapter. The stocking of the creek is a special event. The stocking truck arrives full of trout ready to be released into the creek at 10 in the morning on the days of the stockings. 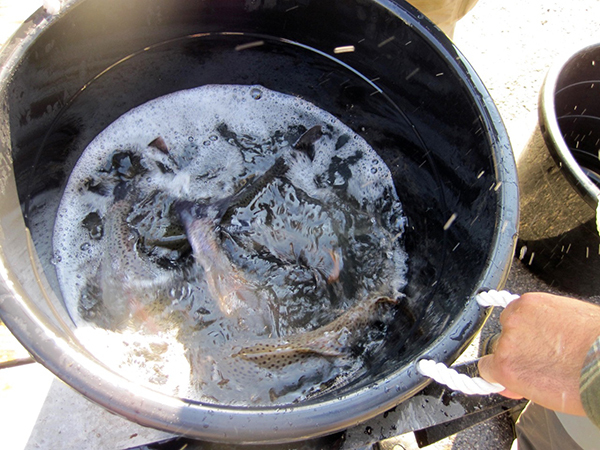 The fish are off-loaded into large buckets partially filled with water and hauled to the creek by an ATV or hand carried. 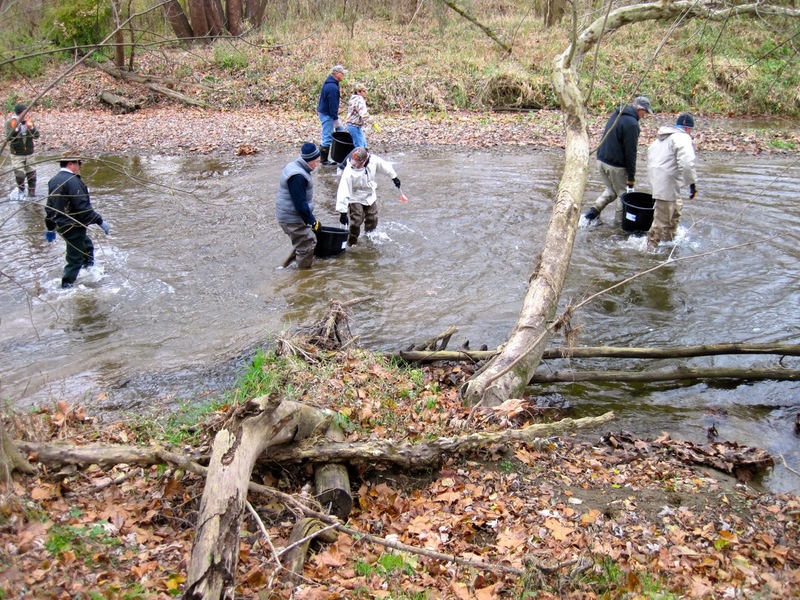 The trout are distributed over a one-mile stretch of the stream into deep holes and runs. It is important to get the fish from the truck to the creek as quickly as possible during this stressful period for the fish. 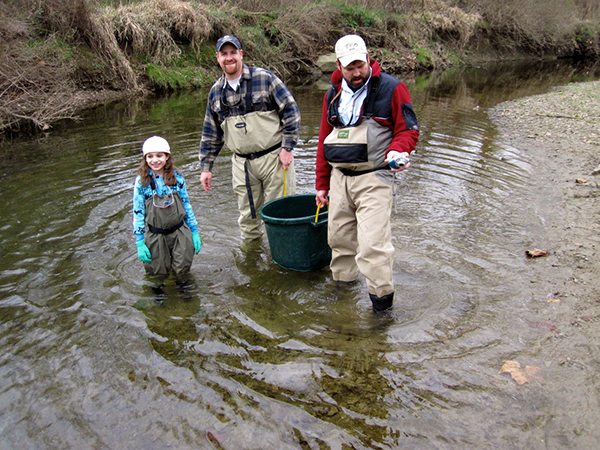 The chapter invites not only Trout Unlimited members to participate in the stocking, but family and friends as well. Everyone gets a little wet during the two hours of stocking, but everyone has a great time as well. Waders or hip boots can help keep you dry, but when the weather is not too cold, wet wading in old sneakers and pants works quite well. This is also a time when we pick up litter from the creek as well as the wooded areas that border the stream. Apple Creek is a beautiful “urban” stream and we want to keep it that way. The stocking of Apple Creek is a special treat for all who participate. Come along next time and join in on the fun! Click on images for larger view and picture captions.